How can we make a significant impact on our city’s carbon footprint? The answer lies in our buildings. Buildings are the most considerable part of our city’s carbon emissions (an estimated 60% or higher), due to the city density, moving pieces (electricity, combustion on site, carbon emissions). Nationally, transportation and energy use seems to be split for leading carbon emissions. 2030 District is a private-sector driven initiative to reduce building energy, water use and transportation emissions by 50% by 2030. Anything from nonprofits to corporations are working together to help building owners reach those goals. Seventeen cities have signed on to similar initiatives, with Pittsburgh is the largest city of the 2030 district network. We chatted with Delaware Valley Green Building Council (DVGBC) to learn about this initiative in Philly. 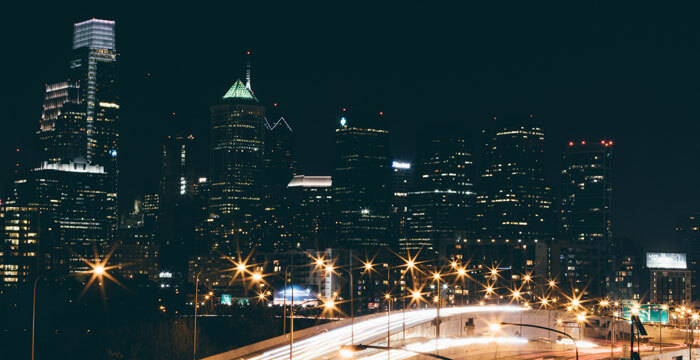 Five years ago, Philadelphia passed a mandatory energy benchmarking and disclosure policy to monitor building use. Every year, about 90% of buildings have complied – which means one-quarter of all the square footage of city is reporting annually on energy and water use. After the buildings report their usage, the city then provides a score with how the building is doing compared to their building ‘peers’. This raises awareness that energy is a controllable cost and to assign a market value to energy efficiency. “We have quite a bit of data to work with” as Katie Bartolotta, DVGBC Policy and Program Manager, explained. Now, buildings can go from compliance to action with 2030. Already, 12 million square feet (AKA equivalent to 14,000 residences) have signed up to be a part of this Philly initiative, with the official launch quickly approaching in October. Focusing on larger buildings, including residential, would make a significant impact. In Philadelphia, there are close to 100 million sq feet of apartment buildings in 50,000 sq feet or higher. The city went from 2000 to 3000 buildings monitored through benchmarking when they added in multifamily buildings. Ultimately, this would help with an overall 5-10% reduction in energy use as a city. SO WHY IS DVGBC GETTING INVOLVED? The Delaware Valley Green Building Council (DVGBC) is leading the initiative and bringing together owners, managers, and developers of properties. As an organization, DVGBC is able to push stakeholders towards more sustainable building use. This helps building owners waste less money on energy, but also helps the city overall to reduce adverse environmental impacts. It’s hard to get people to pay attention when, for example, renters are spending a set amount on utilities each month and aren’t seeing the impact of their energy use. Tenants are starting to demand Energy Star and energy efficient buildings. What happens with new construction? The goals for new buildings will be carbon neutral by 2030, by energy efficient design (in part to Architecture 2030) and how much energy a building is using on site. WHAT CAN BUILDINGS DO TO REDUCE ENERGY CONSUMPTION? Recent political developments have heightened the sense of urgency for individuals and building owners to take action on reducing carbon footprints. Although the EPA and the federal government may set standards for programs like Energy Star and these programs are threatened on the EPA chopping block. But the bright side is that the cost savings help on a local level – regardless of what’s happening in DC. For residents, investing in automated thermostats (like a Nest) tend to automate tasks, save energy and help you think less. HOW DOES RENEWABLE ENERGY FACTOR IN PHILADELPHIA 2030? WHY FOCUS SO MUCH ON ENERGY EFFICIENCY? For the quickest impact and most significant opportunity, energy efficiency makes sense. Energy efficiency in buildings will help get 36% energy savings (out of 80%) as part of the Philadelphia City Energy plan. Unfortunately, there’s not a lot of “room” downtown for renewable energy (such as solar panels or wind turbines), so purchasing renewable energy credits (RECs) makes more sense for buildings especially when they’re 50,000 sq feet or larger. If you covered 80% of city buildings in energy panels, there would be 1-2 % of energy savings. Don’t get the message wrong: solar and wind still are essential! But if we want to reduce energy quickly, it makes sense to work on efficiency as a more extensive focus (while encouraging renewable energy suppliers/methods). HOW CAN YOU GET INVOLVED IN PHILADELPHIA 2030? This program is piloting in Center City and University City, and appropriate for non-single family residential structures. Be a clean building advocate! Encourage building owners, employers, etc. to get involved. Recommended buildings are 25,000 square feet or above. If your building doesn’t qualify, you can also contact programs like the Energy Coordinating Agency. Stay tuned for announcements soon and the DVGBC website for other ways to get involved. This article originally appeared on Green Philly Blog.